This is very generous! Thanks for the giveaway! Look like an awesome articulation app! Sounds like a great opportunity. I hope “LUCK” is with me. Thanks for this giveaway! would love to win this one. This is a great giveaway! Thank you!!! Thanks for the giveaway, Jenna! Thank you so much for the giveaway opportunity. this would be a great addition to my ipad! Yay for giveaways!! Thanks so much!! Ive entered so many giveaways for this app, keeping my fingers crossed that this is the lucky one! Love this app. I love this app! Its on my wish list for school. …wouldn’t my sped director love me if I won a copy! Thanks for all the great updates and materials! This is supposed to the the BEST artic app out there. Would love to win it!! Can’t get enough of these app giveaways!! Thanks for sharing all your hard work. luv luv luv little bee! This looks like an amazing app! Thank you! I love articulation station but don’t have it on my current ipad! This is perfect for my artic caseload! Thanks for the giveaway! I have been eyeing this app for some time now…thanks for the giveaway! I have also been wanting to purchase this app, but with a limited budget – it hasn’t been possible. This would be so helpful with my large caseload of artic students! Our speech pathologist used this app with our son, and she highly recommended it and our son loves it. It’s on our list of purchases to help him with his phonological speech disorder. Would love to win it and use it with my son and other relatives children who have speech delays. Thanks for the give away. This one definately ROCKS!!!! So excited for this chance. Just got an ipad thru a grant and would love to have a chance to try this great app. Not much funding left for apps. Thanks again for this opportunity! I would love to have this app. It’s so nice to be able to whip out the IPAD and have all those articulation sounds ready to use. Looks like an awesome artic app! thanks for the opportunity! this would be very helpful cuz i have a lot of littl eartic kids who are gettng sick of paper cut outs! Loving this giveaway! Top of my wish list. I love this app! It’s great for data collection and the kids love the pics. I would love a full copy! thanks for opportunity to win this! I love the /p/ version that I have but would love the full copy. My iPad wants this app soooooooo bad! I love the free version of this app! I would love a copy! Awesome! I would love to win this! I love this App! And as I new clinician, it would be awesome to have the whole set! Such an awesome, generous giveaway..I’d love it! It would be awesome to have this — I just have the sample now! I would love this app! It looks great. I would love to have this app!! Looks like a great app!! 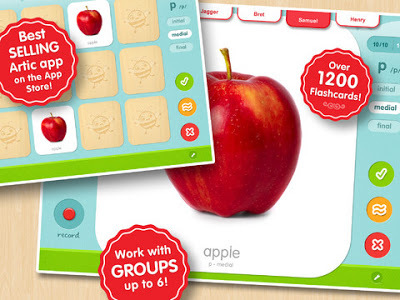 I would LOVE to win this app and use it with my artic kiddos! Thanks for the giveaway! This app looks great! As a first year SLP this sure would be a great app to own! I would love to have another artic application when my kids get bored (or I do) with another one that I have. This one seems to have much more than any others I’ve used – with phrases, sentences, games, and reading levels. Thanks! Awesome! Thanks for the giveaway!! This is an amazing app and I would love to be one of the lucky winners! Thanks for this giveaway! This is an amazing app! My colleague uses it all the time and made me covet it :). Thanks for the giveaway! This looks great. Would love to check it out. About to jump into the real world as a first year SLP, and this would make it that much more awesome! Awesome give away!! I would LOVE to win Articulation Station -my kids are tired of /p/:0)!! Thanks Little Bee Speech and Speech Room News!! My iPad really needs this app!! With ever shrinking speech budgets at school, this would be a great app to have for free! Would be a great app to start off a brand new SLPs repertoire! Thanks for another chance to win this! I would love this app! Thanks for a giveaway! You Rock! Love the blog! Thanks for the awesome giveaway! What a generous giveaway! This would be perfect for my artic caseload. I love this app, use it all the time at school on their copy but would LOVE to have it for my ipad that I travel with!!! Great give away thank you! Love your blog and the Giveaway!! As a new grad I would love to have this! I am a CFY and am building my collection of materials. This would be a perfect addition! I hope I get a copy! I love your post and TPT products. I love your blog and all the goodies you share!! Thanks! I love love love this app! I have it on my work ipad but would LOVE it on my personal ipad!! Huge fan of this app! I really like that it covers more than just word level. Would love to put it on my personal iPad! I’ve heard many good things about this app, and would love to try it out myself! I would LOVE to have this app (and so would the kids!). I’ve been wanting this App for a long time! Thanks for all you share on this blog! Love it! Love this app because of the realistic pictures. Because of that I use this app to target other language goals, not just artic. Great app, I’ve had this on my wishlist for a while. Thanks for a great blog and all of your wonderful ideas! Would love to win this app!!! Thanks again for all the great ideas and app offerings! This would be a great addition! I currently use the “free” version of this app, and it only goes so far. 🙂 Thank you for such a generous giveaway! Was just talking about this app today..would love to win this! I would love to win this! Thanks for hosting the giveway!! I would love this!!! My kiddos love the iPad! I have the lite version, but would love to have the entire app! I loved using this app during my school based externship! Thanks for the chance to win! I’ve been wanting this app forever!!! This app looks like it would be great to use in therapy! I’m a brand spanking new SLP, and would love to add this to my growing collection! Thanks for the giveaway! I would love a copy to help improve my child’s speech. He is a bright 4 year old boy who talks a lot but cannot converse well with adults since they cannot understand his baby talk. He loves the trial version and the full version would surely help him a lot. Thanks! As a homeschooler with a severely speech delayed child I would love this! I have the lite version now, but would love to use the full version everyday! This app is incredible! Would love to win it as a CFY! Great giveaway. Need some luck. Yeah! Thanks for the opportunity! I would love to have this app to use. I have the demo version and it is very motivating to students. Looks like a great app. Thanks for the giveaway!! Thanks for the giveaways! Very generous in these very tight budget times. I need an artic app!! Pick me, Pick me! Thank you for hosting so many giveaways! I would be so grateful for this app! We just got iPads in our district, but have no funding for apps. My kiddos could benefit so much! Thanks for the opportunity to win! My speech students LOVE using my iPad in therapy! This app would be so wonderful for my students! Thanks for having this opportunity to win it! This would be a great app to have for school! I just got 5 itouches for my room and I would love to have this app on one of them!! This would be awesome in my clinic! I’m sure all the therapists would love it!